Extreme Fruit & Nut Muesli Gluten free corn flake and rice crisp muesli with mixed nuts and mixed dried fruits. - Gluten & wheat free. - Dairy & casein free. - Low in sodium. - Made without GM ingredients. It all started in the small bakery of our health food market on Main Street in Glastonbury, Connecticut. Since 1992 we have taken the highest quality ingredients and crafted them with care into culinary marvels for our friends and customers. 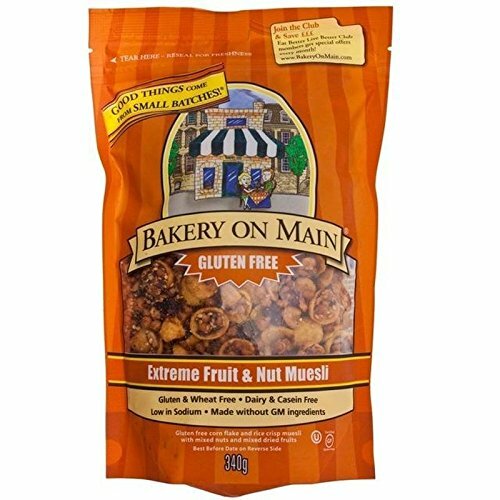 Our passion for great taste and commitment to good health led us to create the Bakery On Main line of Premium Gluten Free Muesli - it's food that's good for you but tastes like it isn't. That's what we're all about, better health and happy taste buds living together in harmony. We hope you love our products as much as we love creating them for you. Thank You!